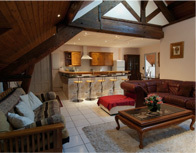 Luxury Chateau apartments near Valence-d’Agen. 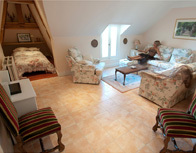 Our beautifully restored and furnished apartments are designed for groups of people, from four to ten. We welcome families and groups of friends, tourists, cyclists and walkers. We have left nothing to chance, with full modern facilities such as a good supply of canopies, TV, DVD and of course, WIFI. And you will always have as much or as little attention from our staff as you need. Relax in truly comfortable chairs and settees, cook your own meals from produce bought from local farms or markets, sleep in luxurious surroundings, make full use of the well-equipped gym and explore our beautiful castle. Located near Valence-d’Agen, between Bordeaux and Toulouse, you can also explore our wonderful, temperate wine-growing region. Prices start from just €1000 a week (low season).